Circuit Court Judge Barry Williams has halted the case which could have put the entire Maryland Medical Marijuana Program in jeopardy. Judge Williams submitted a written ruling which has ultimately paused the case until further notice. With this ruling the Medical Cannabis Commission, whom is the authority on the medical marijuana program, will be able to continue issuing final licenses to the pre-approved cultivators. The Court of Appeals issued this announcement just moments before the Baltimore Circuit Court hearing was set to convene earlier this morning. The Court is still analyzing allegations that the Maryland Cannabis Commission improperly picked companies to grow the medical marijuana. The lawsuit stems from a company who alleges that the Commission broke the law by not considering racial diversity when picking growers for preliminary licenses. Alternative Medicine Maryland is one of the companies making these allegations. John Pica, the attorney representing Alternative Medicine Maryland, has spearheaded the efforts to halt the program and restart the licensing process. Judge Williams halting of the case is optimistic news for the Program. Last week Williams issued a temporary restraining order to prevent the Maryland Medical Cannabis Commission from issuing any further marijuana cultivation licenses. The Commission has already approved and issued a final license to one of the approved growers, ForwardGro, of Anne Arundel County. 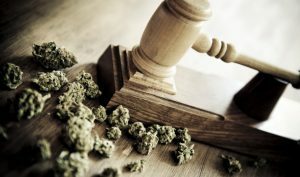 13 of the 15 companies who were awarded approval to cultivate marijuana had representation from their lawyers and had asked the Court to stop the hearing so that they could voice their opinion regarding this case. While this victory may be temporary, it is a huge step in the right direction for Maryland’s Medical Marijuana Program. Maryland’s program was enacted over four years ago, but has yet to begin dispensing the medication. With this ruling, the Commission can issue final licenses to the approved growers and expects the medicine to be available by mid to late summer. Growers, processors, and dispensaries have spent hundreds of millions of dollars in preparing their facilities and meeting the requirements set forth in the regulations. These entities are building out and trying to finalize their licenses so that they can provide relief to the thousands of patients who await the program’s commencement. There were hundreds of patients and pre-approved license winners who came out in support of the program and rallied behind a favorable ruling by the Court. This case has the ability to affect numerous businesses and thousands of patient who have waited patiently for over four years. The people of Maryland stood strong in protest of any further delays to the beginning of this highly anticipated program. Thousands of patients who deal with a diverse range of debilitating conditions and countless medical marijuana advocates were ecstatic to hear that Court will allow the program to continue. This is another great stride in the right direction for the Medical Marijuana Program! If you are interested in learning more about this medical program or would like to begin a bona-fide relationship with a registered Medical Marijuana Doctor please contact Greenway Consults at 410-762-8745.